GitHub is a fairly large production Ruby on Rails application. From a scale perspective, it serves hundreds of millions of requests per day. Until now, we’ve been running an outdated, heavily-modified, unsupported fork of Rails, which we called 2.3.github. This choice has bitten us in the form of gem incompatibility, having to manually backport security patches, missing out on core framework performance and feature improvements, and being unable to easily contribute back to the open source rails project. We had work to do in order to live in the modern world again. One of our biggest concerns with this upgrade was performance. How would this version of Rails perform against its predecessor? Would shipping it cause additional load for other services? Are the appropriate metrics being recorded so we can measure performance improvements/regressions? 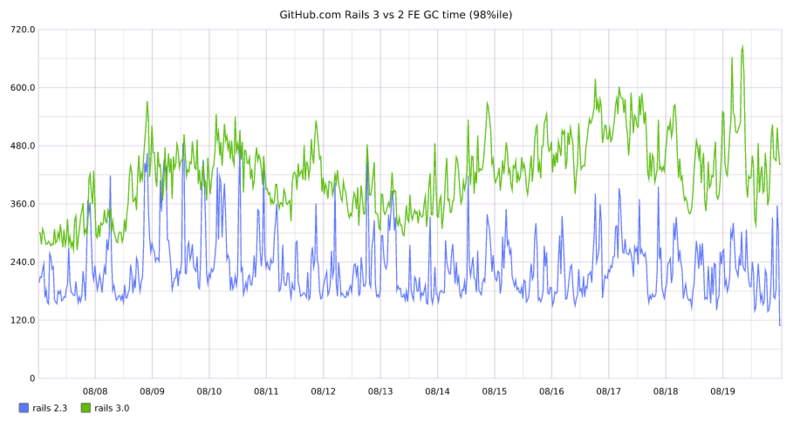 We then re-ran the benchmarking tests under Rails 2.3.github, compared the results, and dug in deeper to figure out what changed. As we figured out which areas of the application could potentially suffer performance regressions, we started tracking metrics around those areas. Knowing immediately if a change you’ve deployed is affecting your users' experience is a good thing. git commit -am "Disabled loading plugins"
In the beginning, we spent lots of time resolving these merge conflicts and keeping our long-running rails3 branch stable. It was a headache, to say the least. Faced with this ongoing pain, the team discussed how we could get all of the changes from the rails3 branch into master in order to escape this life of merge conflict resolution. Our approach involved enabling a dual-boot of the application under Rails 2 or Rails 3 by switching on an environment variable. Think of it like swapping out the V6 engine in your car with a V8. The car should still start, no matter what type of engine is under the hood. gem "will_paginate", rails3? ? "3.0.3" : "2.3.9.github"
Given that the application should behave the exact same between versions of Rails, in terms of serving up an equivalent feature set, a dual boot environment also meant that we could run Rails 2 and Rails 3 side-by-side in production. If we saw performance or behavior regressions in certain areas of the site, we scaled back. 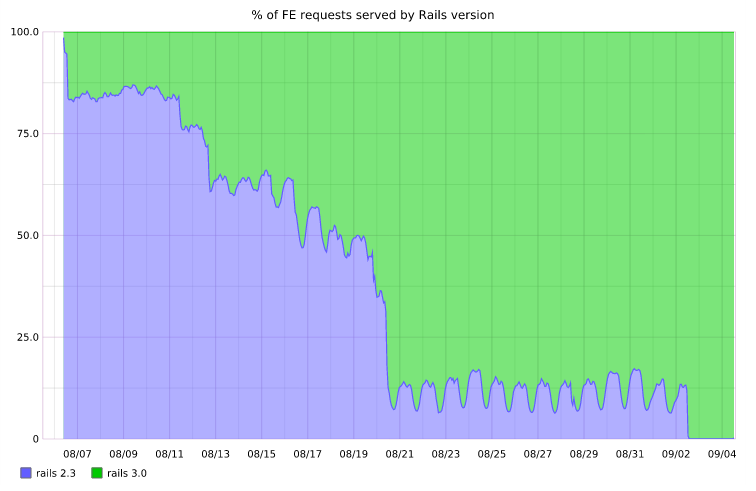 If we saw no change, and no exceptional behavior, we scaled up to more servers running Rails 3. Getting the application into a state where it could boot under Rails 2 or Rails 3 required backporting all of the existing changes from our rails3 branch into master. Once we got past that, it was magical. Our diffs were smaller, and merge conflicts were rare. We made sure to get any new upgrade-related changes into master (and out on production) in a timely manner. This kept our diffs smaller, more reviewable, and more shippable. And we soothed our merge conflict headache. Once instrumentation was in place, frontend servers could run Rails 2 or Rails 3, and diffs were easier to review, we had a lot more time to make progress on actually fixing the bugs and blocking performance changes that we discovered during the progressive rollout. We’re already discussing how to apply these lessons to our next upgrade, and I hope you will too! If you enjoyed reading this, you should follow me on Twitter.